After our recent visit to the Asia Market in Beziers, The Southern Woman That I Married and I decided to try out a local place for lunch. One of Cathey's favorite cooks is Somebody Else because when Somebody Else cooks, Cathey doesn't have to. It's not that Cathey doesn't enjoy cooking. But every once in a while, a vacation from the kitchen is required in order to keep Cathey happy. And keeping Cathey happy is an important part of my portfolio. There's a McDonald's around the corner from the Asia Market. I haven't been in a McDonald's since the year that the cow had the two-headed calf for a reason. The only thing worth eating at McDonald's are the fries and decent fries are just not enough of a reason to spend my lunchtime trying to gag down one of their burgers. 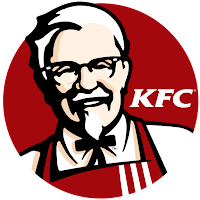 Anyway, having found a coupon for KFC on the back of our register receipt from Carrefour, we decided to give the local KFC a try. Regular visitors to this space will remember that the local Burger King was jumpin' on a winter Friday recently. The same cannot be said for the KFC that we visited in Narbonne. Well, the location wasn't as prime and it wasn't Friday. But there were cars in the lot and folks were having their lunch inside. So we gave it a try. We both had the cheapo special - a fried chicken 'breast' on a bun, fries, and a drink for 4.99€. Under 10€ for both of us for lunch. How could you go wrong? Here's how you could go wrong. It just wasn't worth it. I suppose that the barely warm chicken was OK, whichever parts of the chicken that the meat came from. And the bun held together okay. But the cheese hadn't melted and the lettuce had given up the ghost about a week earlier and the fries had clearly spent too much time under the warmer without becoming particularly warm. Very disappointing for a first taste of fried chicken in four years. And so, after finishing our shop at the Asia Market, we went around the corner and down about a block to La Pataterie. 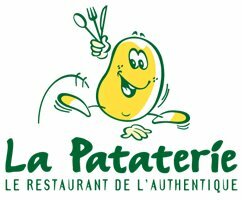 For those of you who are not familiar with La Pataterie, there are 18 or so of them scattered mostly throughout central and southern France - one apiece in Beziers, Narbonne, Montpellier (St. Jean de Vidas), Perpignan, and Carcassonne. Toulouse appears to have been spared. Cathey ordered a Patata Burger Simple, 125 grams of Charolais beef with raclette (cheese) between two potato patties. That's right. No bun. Two crispy potato patties about the size and thickness of the beef patty that they sandwiched. I had the La Gaillard Simple, onion confit and a thin slice of French bacon on the inside, and a slab of grilled goat cheese on top. And two potato patties. The beef was quite good. The idea of replacing the bun with chunks of potato was...well...unique. The almost hot fries were generous and the side salad, with dressing no better than bottled if it didn't actually come out of a bottle, at the very least had more life than the lettuce that had graced our KFC sandwich. We spent about three times as much as we did at KFC, about as much as we would have spent for lunch in one of our favorite, more traditional French restaurants. But at least we came away satisfied...and with a slight buzz from the beer. So in comparison, La Pataterie won the day. I'm not certain what that means in the end, though. I doubt that I'll be able to drag Cathey through the door of either KFC or La Pataterie in future. But Cathey has agreed to put together a fried chicken dinner in a couple of weeks. Life is good. I consolidate all of my food writing and restaurant reviews HERE. Take a look if you have a minute. I am a Pataterie fan! , loyalty card first name terms with the staff..the works . We love the servive and huge meals for 30 bucks including beer and a mirabel cocktail for Anna , the dog has a bowl of water delivered to the table and the place is cleaner than most places with proper toilets with soap! Every so often discount vouchers arrive ...I get about 3 free meals a year from them . Chaque un sa truc as we say ..lol...great reviews Ira ...We are close to you ...we should meet for a fried chicken meal one day ? I cook mean fries ! I'm glad that you enjoyed the review. When the weather warms, message me on FB and we can meet up.